The pairing of Cancer and Virgo is one of the better combinations in almost all the relationships. Care and nurture is a strong theme among these two. This is most likely to be a low-key relationship perhaps not as exciting as some, but rich in a quiet way. There is also a lot of respect between the two of them, and a feeling of security that is enviable. Cancer are highly valued by people for their subtle and compassionate nature. They never harm anyone intentionally and are themselves cautious enough to keep away from all kinds of harms. Cancer like to think about the sad incidences that have transpired in their life. They are fully equipped people with hard shell determination to achieve their success which is generally in terms of money. They give a lot of priority to money because for them it is a necessity. Cancer are very gentle and kind but can get very hurt if someone criticizes them for anything and also at the same time they are quite prone to flattery and pampering. People around should be aware of their mood swings or else they might get surprised by their constant change in behavior. Virgo are very practical people with strong intellect and detailed information of all the aspects of life. They are the perfectionist with rules to abide everyone around them. They are usually success hungry, and take short, calculated and precise steps to reach the desired destination. Virgo are most comfortable when they spend time alone, because then they do not have to change their lifestyles according to the whimsical needs of other people. They can be very choosy about things and are most likely to pick up the best item from the entire lot. They might show their generous side when it comes to issues related to other people. These people can be quite obsessed about the responsibility towards their professional life. During the initial phase of any relationship, Virgo do not exhibit their false pride whenever they are with Cancer. And similarly even the Cancer would try to get out of their protective cocoon. Virgo feel very comfortable with Cancer because they do not control them totally like other people. A Virgo can appreciate Cancer’s sense of humor because it exudes the right amount of humor and sophistication. Since Virgo are an excellent critic, they can easily assess and appreciate Cancer’s great determination. Cancer like Virgo for their responsible attitude and both of them like to earn money and build a status in their society. Virgo always want to remain independent throughout their lives and they would simply hate the idea of being dependent on somebody. A certain sense of security is experienced by Virgo through the protective nature of Cancer. Even the Cancer like the company of Virgo. Virgo can always teach the Cancer to be a little rational and not take everything to the heart while Cancer teach them to be more tender and kind towards the mistakes of others. When both the Cancer and Virgo unite together then they have a great quality of curing many types of physical and mental illnesses. When they remain alone then they can easily succumb to depression because of their brooding nature. So they should try to stay together so that they ward away feelings that are the causes of their depression. Virgo can be quite sympathetic towards the Cancer when they go through phases of depression by thinking about the memories of past. The Cancer also show a lot of appreciation for the humble gesture shown by the Virgo. Cancer and Virgo share a happy and casual bonding in almost every relation of theirs. As sibling, friends, colleagues and relatives, they share a bond which is easy and nurturing. They help each other to grow, stand of each other and teach a lot to each other from their own experiences. Usually they never face competition as none of them is eager to get attention but money definitely plays an important role. Cancer and Virgo can also have a stable business venture with some appreciable success and profits as both are intelligent and money minded. 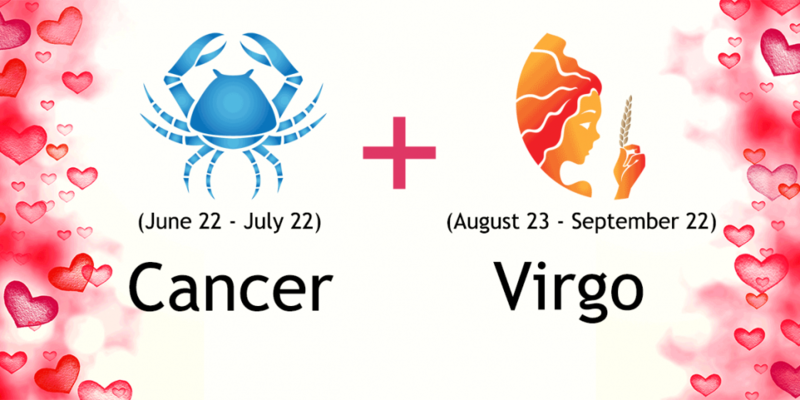 Love connection between Cancer and Virgo are usually a success except for the chances when Cancer is too eager to tie a knot and Virgo needs time to think over. Parenthood and childhood are both equally welcoming for these two sun signs as they are loving, caring and ready to take responsibilities. Some kind of misunderstandings might crop up in the relationships shared by Cancer and Virgo as Virgo like to think about things whereas Cancer like to act according to their feelings. If Virgo are not aware of this trait then they might hurt Cancer by behaving with them in an overtly pragmatic way. Even the Virgo might get surprised when they start to experience the changing mood swings of the Cancer. Both of them should try to be less critical about each other, as they both cannot accept criticism wholeheartedly. Virgo can be termed as perfectionists, but when things are not prefect then they can become very critical. On the other hand, Virgo should remember that the Cancer are very sensitive and they can get offended with criticism. Virgo can learn to be a bit patient from Cancer, and likewise Cancer should learn to be become rational and a bit stern in life, so that they can deal with criticism in a better way. I am a cancer female and recently reconnected with a virgo male. Talk about slow moving. Wow this describes him to a “T” the relationship is so slow moving, it’s probably growing mold. At any rate, we have a great connection and I always felt like he was the one that got away. It was his elusiveness that kept me away the first time. He is so cautious with his feelings and not willing to share his romantic thoughts. Very protective of his feelings. Has been hurt so it’s like protection “on crack.” I love his mannerisms, personality, presence… the list goes on and on. He is a man’s man. I feel safe with him. I can open up and share my deepest self. While I’m a true communicator, he is not. That drives me crazy and I know my constant moods puzzle him. What he tells or promises is somewhat diminished by his actions. All and all, I am willing to wait. He is a good person. Wouldn’t mind meeting another cancer woman. Late wife, second one, was a cancer and we were very happy. I’m A Virgo and my Mate was a Cancer. We were Childhood Friends , We met in 5th Grade and became Best-Friends in 7th Grade. I told her that I was in Love with Her and Could not Live Without Her. But Sadly She was in Love with Someone Else. I let her Go , Not because I dont Love Her , but Because She Loves Another Guy. I want her to be Happy. your life is not your own. Please don’t take it from those who love you. I am a cancer woman and i recently broke up with my virgo boyfriend of 3 and a quarter years. My virgo man was the man of my dreams! He was everything a girl could ask for in a man! I think virgo-cancer compatibility is really high. We were both insanely in love with each other. The only reason we broke up is because i cudnt accept his marriage proposal because im in a truly messed space in my life right now and i didnt wanna drag him into it and give him misery—and he is being pressured into getting married anyway due to external reasons. I have recently got out of a rocky 8 year long relationship with a Gemini . Good times were overwhemed by some bad moments . Took its toll on how much i could stand. Im a Virgo man and over the past few months i have been in a blossoming friendship with a Cancer woman who lives far from me. She pursued me via Facebook through remarkable conversations about topics we share common interests in. She is a single mother of 3 and so full of life and all around positive vibe. It pains us to be so attracted on a conversation level and not being able to be together at this time due to the gp between us. But i feel like she is more then worth the journey to be with her. We just clicked instantly and its like a fairytale. I cant move to meet her just yet and neither can she. But despite the gap i told her that i have waited this long to find her and i can wait a little bit longer just to be with her. I live in VA and she in Colorado . Its maddening at times but everytime we talk , i feel like we just keep getting closer to each other spiritually. Cant wait to see her when she comes to visit me on her vacation. Its good to feel loved again. virgo women and cancer men is the perfect for each other bcoz they have many similaraties.both are very emotional and family person , both are very practical. and me and my cacerian men i throught is the perfect match for each other.canceria are very caring but some times short tempered but by heart they are very loving . I truly was in love with cancer, but the stupid problem with him is ongoing help on his relatives- financially help involve all the time. I have to brake up with him as he is just being sympathize with his relatives using my money and my support. I’m Gay & a Virgo man &my Boyfriend is a Cancer .This is totally true . We love each other a lot . This is so true. The is me and my husband. I am a very emotional person, and he didn’t understand that when we first were together but he’s understanding it now after 7 years. This rings so true to the plight of the Cancer and Virgo!!!!!! This describes us. I have been married to a cancer woman for 3 years. The only thing different about this explanation is that I’m a capricorn not a virgo. omg the describes me and my boyfriend perfectly! I do love his sense of humor…..
My fiancee’ is a virgo man and I the cancer woman of 10 years. We have differences. He can be very social and I am choosey about who I socialize with. We share a deep intimacy between each other, it began intimate and remains strong. He is not always open to talk things out, whereas,I need to get it out in the open. This describes me and my husband exactly wow!